Godfrey Shackleton, international cricket umpire and famous Lottery winner, is coming to the end of his innings. Before he leaves the Middle for the very last time he needs to put his affairs in order. This gentle comedy drama is about life, death, dreams, family, fun and friendship. Join Godfrey’s journey through the tears and smiles as he spends his last summer. Talking Stock Productions&apos; witty, charming and moving plays enjoy sell-out performances around the country. This play is the third to feature the loveable Yorkshireman, Godfrey Shackleton after &apos;Godfrey&apos;s Last Stand&apos; and &apos;Godfrey&apos;s Last Love&apos;. It is not necessary to have seen the other two plays to enjoy this &apos;stand alone&apos; story. 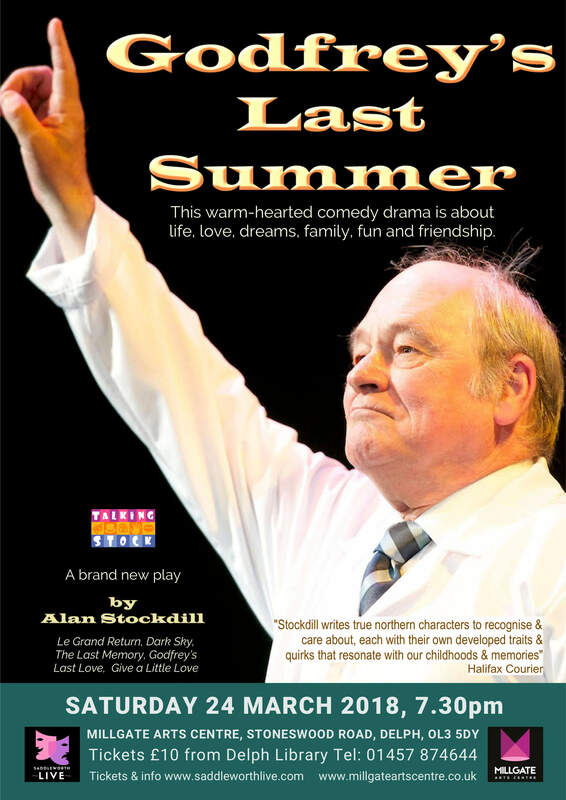 Alan Stockdill is a highly regarded award-winning Yorkshire playwright. &apos;Le Grand Return&apos; by Alan Stockdill was declared winner of the Best New Writing Award at the 2015 Greater Manchester Festival Fringe. "Stockdill writes true northern characters to recognise and care about, each with their own developed traits and quirks that resonate with our childhoods and memories"
"As usual with this company, there are serious, thought-provoking undertones, but also plenty of laugh-out-loud moments to savour as the ingeniously engrossing plot twists and turns its way along". "It’s a real treat to see an Alan Stockdill play. He is a master at drawing out the idiosyncrasies of character and taking his audiences on the most incredible journeys." BLOODWISE The blood cancer charity. Talking Stock raise money for charities by creating and performing wonderful theatre. Over the past five years they have raised over £24,300 for different local causes.